This unique witchy tale does a great job of showing kids the meaning of having Christmas spirit. 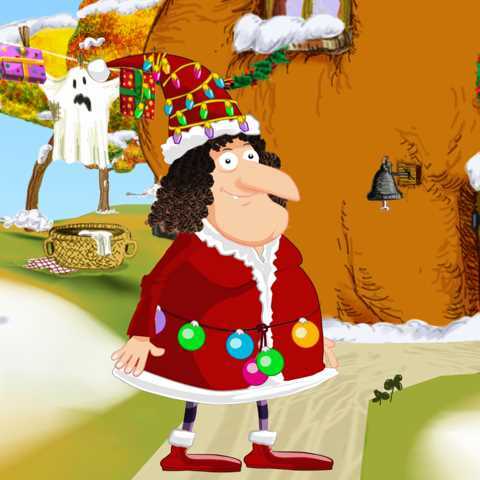 The Witch and the Christmas Spirit is an animated story about a witch who travels to the North Pole to save Christmas. Told in 24 pages, with six games embedded therein, this app shines because of its cute story and movie-like animations. The six games can be played on three levels of difficulty. Readers can choose to have the story read to them or they can read it themselves. In both options, the pages offer many hidden hotspots that animate when touched. In iOS, The Witch and the Christmas Spirit is a free download that offers the first six pages for free, with an in-app purchase of $3.99 needed to unlock the rest. In Android, there are two versions, a demo version with only the first six pages, and the full paid version. The best part of the book is after the free part, so I would recommend you buy the full version. This review is of the full version. The star of this book app is a goofy witch named "Witch with No Name," who has already starred in several other book apps, including The Witch With No Name and The Little Witch at School. When her friend Peepo the Elf rings her up on her crystalballophone and requests her help to eradicate a sleeping illness that has taken over Santa's Workshop, the witch hops on her broom to fly to the North Pole. With the reader's help, the witch and Peepo wake up all the inhabitants of Christmasland so that they can return to the business of readying Santa for Christmas Eve. In the process, the witch learns about the holiday of Christmas and what Christmas spirit is all about. By making a Halloween witch the heroine of a Christmas story app, The Witch and the Christmas Spirit delivers a unique tale. This mashup works well because, as the witch helps, she learns about the meaning of Christmas; and her discovery is the reader's discovery as well. Santa explains that the Christmas Spirit is about sharing, friendship, and kindness -- three traits the witch demonstrates or experiences while restoring health and order to Christmasland. Other things that make this app fun include the use of humor, the involvement of the reader in the story through interactions, and the playing of minigames. For example, readers help the witch cast a wakeup spell by shouting into the device's microphone. They use memory skills to combine the parts of dolls and robots in the right way. And kids use math to combine snowballs to create balls large enough to build a snowman. For humor, kids see that the reindeer have gotten fat by eating potato chips while watching TV. 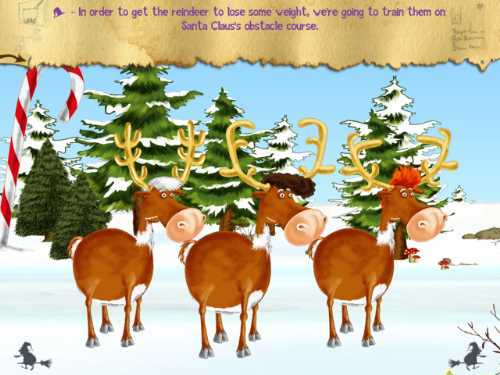 Since Santa has been asleep and not training them, it is up to the player to run the reindeer through their paces and bring them back into shape so they can fly. Kids help train the overweight reindeer by running them through an obstacle course and tapping on the animals when they are supposed to jump. This book app has an easy-to-access Table of Contents, so readers can jump to a favorite page. The words don't highlight as read. But the app's ability to set difficulty levels for the educational games is helpful. The Witch and the Christmas Spirit is a fun seasonal app to explore anywhere from October through December, since it showcases both Halloween decorations and Christmas themes. It is a rollicking, fun tale filled with improbable friendships and lots of heart. At its core, it is a story about helping and supporting others, making it a perfect Christmas app. 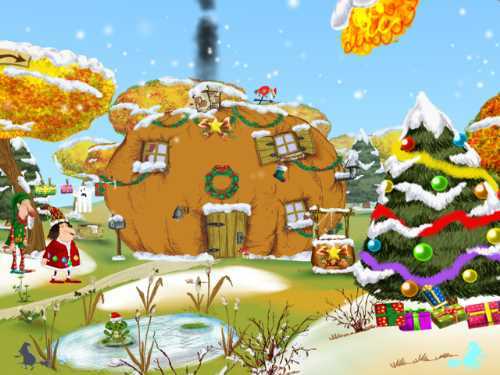 For additional Christmas apps, check out Fun Christmas & Holiday Apps for Kids. 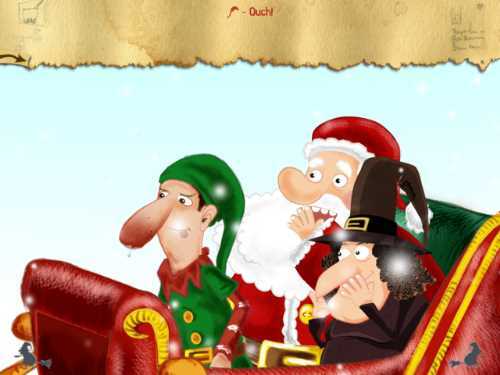 This The Witch and the Christmas Spirit app review was written by Jinny Gudmundsen.